Is the English spelling system irrational? The French have gotten themselves into one of their recurrent linguistic lathers, this one over the changes in their spelling that will be taking effect in the fall. The changes were originally proposed more than 25 years ago. But nothing much came of them until the government recently announced that they'd be incorporated in the new textbooks, at which point traditionalists took to the barricades. The government has made a point of calling the changes "rectifications" rather than reforms, and on the whole they're pretty minor. A few words like "le week-end" and "le strip-tease" will lose their hyphens. The word for onion, "oignon," will have to give up its silent i. But what people have gotten most worked up about is the elimination of many of the circumflexes. That's the pointy little hat that sits on top of vowels in words like "hôtel" and "tête-à-tête," marking the spot where a letter was lost sometime in the past. The changes are supposed to make the written language easier to learn, but there are too few of them to make much of a difference. Mastering written French is still going to be as much of a slog as it's always been. Bear in mind that this is a language that has eight different words all pronounced as "o," each of them with its own distinctive spelling. Even so, critics have attacked the reforms as a dumbing down of the language of Molière and Victor Hugo. Opponents have launched a Twitter campaign with the hashtag #JeSuisCirconflexe, echoing the #JeSuisCharlie of the Charlie Hebdo attacks. This being France, the debate is laced with political theater. The far-right National Front warned of the obliteration of French cultural identity, and one critic compared the government to the Bolsheviks, who eliminated some letters of the Slavic alphabet when they came to power. And indeed, when the reforms were originally announced by the socialist government of François Mitterrand, some proponents invoked the spirit of the French Revolution. The linguist Bernard Cerquiglini compared the circumflex to a crown that sits on the head of certain vowels and suggested tongue-in-cheek that the government was merely eliminating the last vestige of royalty. From where we sit, it's all entertainingly Gallic. But then, who are we to talk? Maybe the question isn't why the French get so worked up about spelling but why we don't. After all, it's not as if English orthography couldn't do with some rectifications of its own. But we haven't had a major controversy over spelling since the early 19th century, when Americans got into a dust-up over Noah Webster's proposals to make our spelling different from that of the English. We wound up making a few symbolic changes, like dropping the u in "honour" and "colour" and transposing the final letters of "theatre" and "centre." But having made our point, we were content to leave everything else as it was. Reformers since then have never stopped agitating for a more rational English spelling system. But all they have to show for their pains is that we've dropped the "ough" in "donut" and "thruway." We share with the French the honor of having the most difficult spelling systems in the world. But the similarity ends there. They see their spelling as a legacy of the literary history that has shaped their identity. As they see it, French spelling may be complicated but it's basically rational, which as it happens is how they like to think of themselves, too. Some scholars point out that English spelling, too, is often more rational than it appears. It can reveal etymologies and the hidden relations between words, like the silent g of "sign" that's pronounced in "signify." But most of us prize our spelling for the very things that make it maddening — as someone once said, it's a "chaotic concoction of oddities." We like to think of it as cussed, unpredictable and not answerable to any official authority, which, as it happens, is how we like to think of ourselves too. So we take a kind of perverse pride in all those sets of words where the same letters are pronounced differently — "Susy" but "busy," "oven" but "woven," "cove" versus "move" versus "love." English spelling is not a game for the weak at heart, and it has nothing to do with higher literary culture the way French spelling does. It's that perverse difficulty we celebrate in the ritual of the spelling bee, which is a purely oral exercise — in theory, you could win a spelling bee without actually knowing how to read or write at all. It's a contest that rewards diligence, not cultivation. Where English spelling is concerned, the imperfect is our paradise. That's why we always resist the efforts to reform it. We may as well resign ourselves to knowing that students a century from now are still going to be wrestling with a dozen or so ways to spell the sound "ay." But we can take consolation in knowing that the conservatism that deters us from trying to improve things also prevents us from changing them for the worse. Our spelling isn't likely to be permanently corrupted by texting abbreviations and the like, no more than it was led astray by the 20th century advertisers who spelled "quick" as "kwik" or the 19th century telegraph operators who shortened words to save time and money. We insist on clinging to our unreasonable customs, and it saves us from our own worst impulses. This is FRESH AIR. The French are having a huge cultural row over some spelling changes the government's about to put into effect, particularly the elimination of the circumflex - the little hat-shaped accent that sits on certain vowels. It leads our linguist Geoff Nunberg to wonder why we never have controversies over spelling like the French do. Why do we insist on putting up with a spelling system that everybody acknowledges is a chaotic mess? Here's Geoff. GEOFF NUNBERG: The French have gotten themselves into one of their recurrent linguistic lathers, this one over the changes in their spelling that will be taking effect in the fall. The changes were originally proposed more than 25 years ago, but nothing much came of them, until the government recently announced that they'd be incorporated into the new textbooks, at which point traditionalists took to the barricades. The government's made a point of calling the changes rectifications rather than reforms, and, on the whole, they're pretty minor. A few words like le week-end (ph) and le strip-tease (ph) will lose their hyphens. The word for onion, oignon, will have to give up its silent I. But what people have gotten most worked up about is the near elimination of the circumflex. That's the pointy little hat that sits on top of the vowel in words like hotel and tete-a-tete, marking the spot where a letter was lost sometime in the past. The changes are supposed to make the written language easier to learn, but there too few of them to make much of a difference. Mastering written French is still going to be as much of a slog as it's always been. Bear in mind that this is a language that has eight different words all pronounced as oh (ph), each of them with its own distinctive spelling. Even so, critics have attacked the reforms as a dumbing down of the language of Moliere and Victor Hugo. Opponents have launched a Twitter campaign with a hashtag #jesuiscirconflexe, echoing the Je Suis Charlie of the Charlie Hebdo attacks. This being France, the debate is laced with political theater. The far-right National Front warned of the obliteration of French cultural identity. And one critic compared the government to the Bolsheviks, who eliminated some letters of the Slavic alphabet when they came to power. When the reforms were originally announced by the socialist government of Francois Mitterrand, some proponents invoked the spirit of the French Revolution. The linguist Bernard Ciccolini compared the circumflex to a crown that sits on the heads of certain vowels and suggested tongue in cheek that the government was merely eliminating the last vestige of royalty. From where we sit, it's all entertainingly Gallic, but then, who are we to talk? Maybe the question isn't why the French get so worked up about spelling but why we don't. After all, it's not as if English orthography couldn't do with some rectifications of its own. But we haven't had a major controversy over spelling since the early 19th century when Americans got into a dustup over Noah Webster's proposals to make our spelling different from that of the English. We wound up making a few symbolic changes, like dropping the U in honor and color and transposing the final letters of theater and center. But having made our point, we were content to leave everything else as it was. Reformers since then have never stopped agitating for a more rational English spelling system. But all they have to show for their pains is that we've dropped the O-U-G-H in doughnut and thruway. We share with the French the honor of having the most difficult spelling systems in the world. But the similarity ends there. They see their spelling as a legacy of the literary history that shaped their cultural identity. As they see it, French spelling may be complicated, but it's basically rational, which, as it happens, is how they like to think of themselves, too. 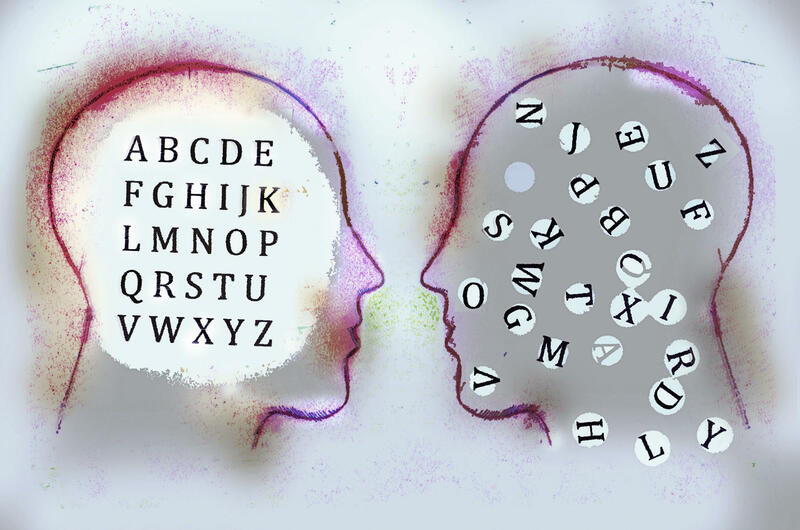 Some scholars point out that English spelling, too, is often more rational than it appears. It can reveal etymologies and the hidden relations between words, like the silent G of sign that's pronounced in signify. But most of us prize our spelling for the very things that make it maddening. As someone once said, it's a chaotic concoction of oddities. We like to think of it as cussed, unpredictable and not answerable to any higher authority, which, as it happens, is how we like to think of ourselves, too. So we take a kind of perverse pride in all those sets of words where the same letters are pronounced differently - Susy but busy, oven but woven, cove versus move versus love. English spelling is not a game for the weak at heart. And it has nothing to do with higher literary culture the way French spelling does. It's that toughness that we celebrate in the ritual of the spelling bee, which is a purely oral exercise. In theory, you could win a spelling bee without actually knowing how to read or write at all. It's a contest that rewards diligence, not cultivation. Where English spelling is concerned, the imperfect is our paradise. That's why we always resist the efforts to reform it. We may as well resign ourselves to knowing that students a century from now are still going to be wrestling with a dozen or so ways to spell the sound A. But we can take consolation in knowing that the conservatism that deters us from trying to improve things also prevents us from changing them for the worst. Our spelling isn't likely to be permanently corrupted by texting abbreviations and the like, no more than it was led astray by the 20th century advertisers who spelled quick as K-W-I-K or the 19th century telegraph operators who shortened words to save time and money. We'll cling to our unreasonable customs and we'll be saved from our own worst impulses. DAVIES: Geoff Nunberg is a linguist who teaches at the University of California, Berkeley School of Information. Coming up, jazz critic Kevin Whitehead reviews some recently released Thad Jones/Mel Lewis Orchestra recordings from 1966 at the Village Vanguard. This is FRESH AIR. Transcript provided by NPR, Copyright NPR.